(2) Work from the bottom up. Grow it up through your organization. (3) Work from the top down. And model behavior. 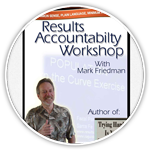 Use performance measurement and accountability in the interaction of the head of the organization and the next level down. (4) Eventually, use a common sense, minimal paper process at every intersection between a supervisor and subordinate. (See the 7 Questions) And use it in the budget process. (1) In any organization the best thing to do is to start small. Prove that something can be successful and most importantly useful and build out from there. (2) The history of performance measurement is that one day the chief executive comes charging out of the shower all fired up about performance measurement, gets to the office, declares that starting tomorrow every unit of the agency will have performance measures. About 3 months later you’ve generated a thousand pages of paper, most of it completely useless. Eventually the system collapses of its own weight, until the next executive comes charging out of the shower. Do not create a thousand pages of useless paper. Work to create one page that actually helps managers run their programs and improve its performance. Whatever else may be true of performance measurement systems, they almost always display too much, not too little data. Typically, for each sub-sub-program, 10 or more performance measures are shown. As we move from sub-program to program to agency levels, the number of displayed performance measures grows exponentially. We provide executive and legislative branch decision makers with a sea of data, and no particular way to sort out what is important from what is not. 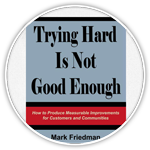 While it makes sense to build performance measurement systems from the bottom up, this does not mean we must adopt the undisciplined practice of using unlimited numbers of performance measures. The first and most important feature of a good performance measurement system is the use of a common sense approach to seeing the forest for the trees. The first task is to contain the data explosion at each step in the construction process. For each level of performance, we could identify the 2, 3 or 4 most important performance measures. Measures not selected here can and should be used, but don’t need to appear in the management or budget document. The four-quadrant sorting bin can be used to help select primary measures at each step in the process. Identify all the “candidate list” of performance measures available in the four quadrants above. Create baselines with forecasts for these measures. 2. For each program repeat this process using the performance measures of the program’s subprograms as the candidate measurement list. 3. For the agency as a whole, repeat this process using the agency’s program level performance measures as the candidate list. In the course of this work it is not uncommon to find programs, and even whole agencies, for which there is very little good data. When this is the case, the data selection process is not about picking the best of good data candidates, but finding any good data candidates. There are rarely any easy answers to this problem. But it is important to proceed with development of performance measurement with what you have and work to improve the system over time. It is sometimes possible to create data, based on sampling techniques (by reading a limited number of case records, for example) as a short term substitute for later data system development. 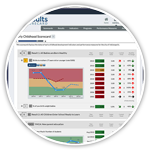 A related problem has to do with the relative scarcity of quality measures in data system reports. Most agency data systems count quantity not quality. Here, one relatively simple suggestion might help. Consider the role of “composite” performance measures, that is, performance measures which are created by calculating the ratio of two existing quantity measures. For example, many agencies count the number of safety or compliance violations among the programs they supervise. By themselves, the raw count of violation totals don’t mean much. But by calculating the ratio of program components with reported violations to total program components, a useful measure of quality can be created. Most good quality measures, whether currently reported or proposed, take the form of composite measures. One of the most common mistakes in the use of performance measurement in management and budgeting is the tendency to implement performance measurement all at once on a grand scale. “Starting next week, every manager of every program and sub-program must begin reporting on performance.” Mountains of paper are produced. Little of it is used for anything. People come quickly to resent the intrusion of these new time-consuming and largely useless tasks. And the system is eventually abandoned. What does this data tell us about performance? Are these the right/best performance measures? The four- quadrant chart could be used to add or drop performance measures in these first meetings. Top management is modeling behavior for the rest of the organization. Still another reason why working from the top down makes sense is that the performance measures of individual programs and subprograms should be tied to the most important performance measures for the agency as a whole. If it is done right, working top down will give people a sense of what top management sees as important, without making this an inflexible and domineering perspective. The best work on performance measurement will be iterative, top down and bottom up. But top-down work of any sort has taken such a beating in the management literature that we sometimes don’t recognize the times when it has a legitimate and important place. This is one of those times.